Sell Tickets app allows you to take orders for tickets over-the-phone or from your physical, on-site box office. To create an order on behalf of a customer, go to “Manage your events”, navigate to the event you wish to make a new order for, click the ‘Order management’ tab and then ‘Add a new order’. You will then be taken through a pop-up window with your event, where you can add the customer’s details to the relevant boxes. For more information, please see Order process for customers. On the ‘Complete your order’ page, you will see the option to put the order through as an operator. This will bypass the standard customer payment process and allow you to process the order. You will need to process their payment via your own means, whether that’s in cash or via credit/debit card payment terminal. 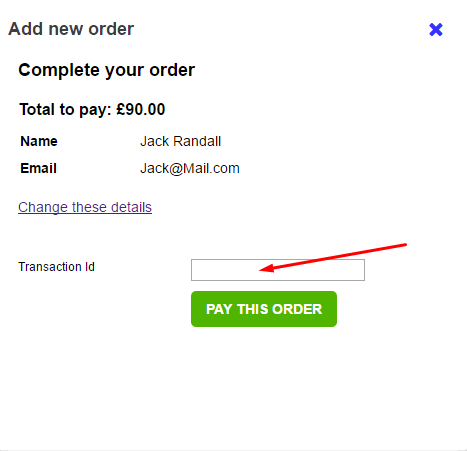 Enter an optional transaction ID (for your own reference) and click ‘Pay this order’. Your order will then be processed by the system and the customer will be sent an order confirmation email as normal.